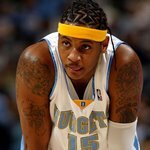 Carmelo Anthony was part of the 2003 draft picks super trio which included LeBron James and Dwyane Wade. Over the past three years he has took the NBA by storm establishing himself in the small forward position for the Denver Nuggets with a current high points score of 45 against the Philadelphia 76ers. His successes on the court have resulted in lucrative deals off the court including major sponsorship deals with Nike and Michael Jordan's Shoes and Apparel line. Carmelo Anthony was born on May 29, 1984, in Brooklyn, New York and has three older siblings. His father died from liver disease when he was only three years old and he was thereafter raised solely by his mother who he moved to Baltimore with when he was eight. By 1992 he was winning local basketball awards and by 1999 he had grown to an impressive 6"5 and was the best basketball player in his area. At Oak Hill Academy in Virginia he became a high school All-American before he attended Syracuse University where he led the team in scoring and rebounding maintaining a season average of 22.2 points per game. After the close of the season Syracuse head coach Jim Boeheim described Anthony as, "...by far, the best player in college basketball. It wasn't even close. Nobody was even close to him last year in college basketball. That's the bottom line." It was a sign of things to come. Feeling ready to move on, rather than continuing his collegiate career he declared himself for the 2003 NBA Draft and ended up 3rd overall choice for the Nuggets. Just in front of him were LeBron James as 1st overall for the Cleveland Cavaliers and Darko Milicic who was 2nd overall choice for the Detroit Pistons. With the addition of Anthony, the Nuggets underwent an extreme transformation from a non-competitive side to playoff contenders. With an average of 21 points, 6.1 rebounds and 2.8 assists per game Carmelo just lost Rookie of the Year honors to the Cavaliers' LeBron James. He did, however, win himself a spot on the 2004 USA Olympic basketball team alongside him. As he has made his mark on the basketball court his celebrity status off of it has also increased. In 2004 he was Punk'd by Ashton Kutcher and in 2005 made a cameo appearance on singer Ciara's single, And I. At only 22 his future in and out of the NBA is a bright one and many already consider him to be laying his stake to the NBA Hall of Fame and Slam Magazine's All Time Greatest Basketball Players List. With his supreme basketball instincts and impeccable court vision you may want to watch this space!